Imagine being responsible for a large fluid-management system that relies on dozens of solenoid valves, many of them arranged side-by-side, to keep an operation dry and smooth. When one solenoid valve isn’t properly energized, the performance of an entire cluster of valves can deteriorate. Moreover, identifying the one problem valve in a bank of up to 50 can take a while. It was this scenario that led to the development of indicator light technology, through which solenoid valve connectors equipped with lights shine brightly when a connector is relaying power but turn off when the connector has lost power. This simple but effective visual cue continues to save fluid power managers considerable time and cost. When an operator surmises that a solenoid valve is not working and begins to investigate the source of the failure, indicator-light technology communicates right away whether power is getting to the suspected solenoid. That means the operator doesn’t have to troubleshoot and test individual connectors to see whether they’re relaying power to their solenoid valves. This can represent a huge savings in maintenance time — and production downtime. Indicator light technology has been a mainstay in electrical connectors since the 1980s, even as the designs and materials used in connectors have changed. 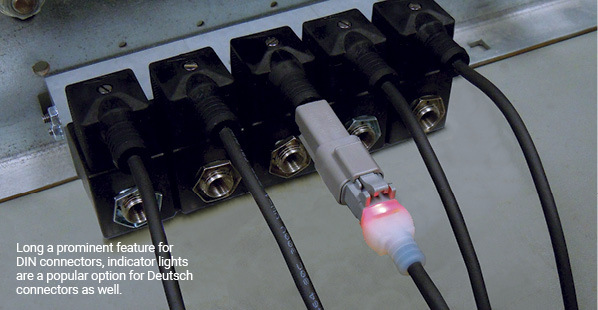 In recent years, with the rise of smaller Deutsch connectors as alternatives to the larger DIN standards, indicator light technology continues in demand. Components used to deliver the technology have changed, however. When this technology was new, connector manufacturers used neon bulbs. Today, some are using light-emitting diodes (LEDs) that add both durability and visibility to connectors. In the future, as better component materials and options become available, more change is likely to deliver the technology better and faster. Saving time and money in the troubleshooting and testing solenoid valves and connectors remains a priority for service technicians and facility coordinators. 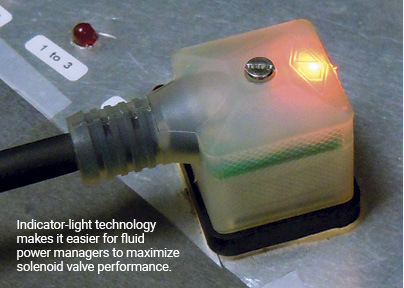 This ensures light indicator technology will remain popular in industry. Fred Behnke is an engineer at Canfield Connector, a leading supplier of electrical connectors for fluid-power applications.